Even though the ground was a bit lumpy, I slept very well last night. We rolled out of bed around 7a and started to break camp. There was no rain in the forecast, so we didn’t set up the tarps, which made putting things away go a bit faster. 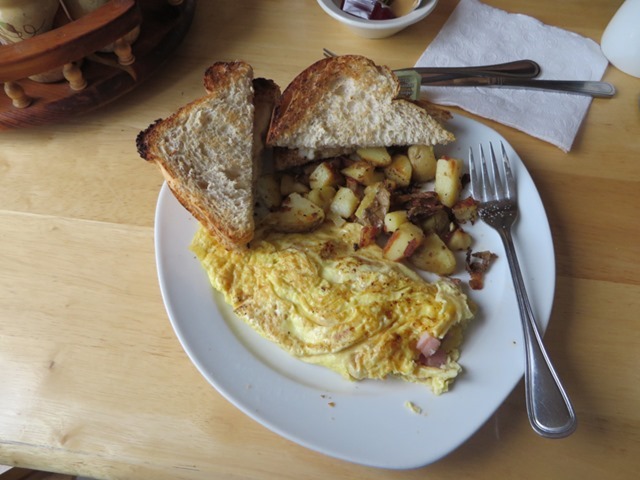 We walked to a little bakery right at the campground for some breakfast. After breakfast, we started our ride. As usual, something wasn’t right and we pulled over after about five minutes. Apparently when my dad dropped his bike last night, he bent a tab that turns his brake light off (his brake light was stuck on). He knew the exact problem and how to fix it. My tire pressures were a little on the low side, so I pulled out my pump and topped them off while I waited. A couple of guys on vstroms stopped by to make sure we were ok. We chatted with them for a bit – they were on their way home to North Dakota. We also got an update on the road conditions that we’re going to encounter along the ride. They mentioned a nasty grate bridge by Teslin (how bad could it be, we’ve already gone across a bunch of them), and the Top of The World Highway having a section of large chipped rock that slowed them down to 5 mph. After our quick bike maintenance, we were off for the day again, and it started to rain. 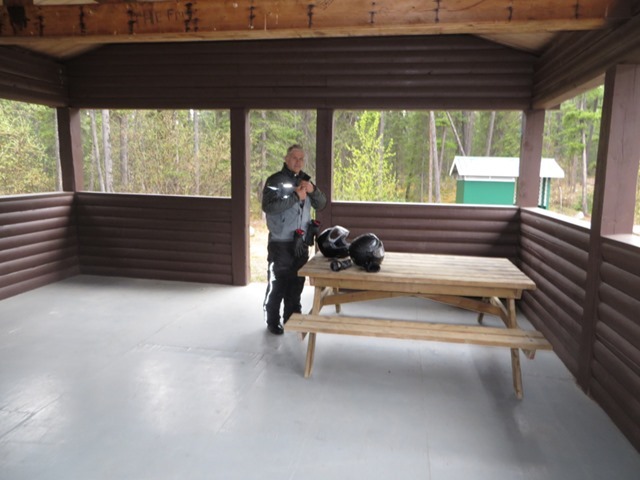 It did not look like the rain would let up anytime soon, so we pulled over at a recreation area to make sure everything was zipped up ok and to put covers on our tank bags. Well, good thing we did because it rained and rained and rained. Then it got cold – the freeze warning went off on my bike and the lowest I saw the temperature on the computer was 36.8F. We both have heated jackets and heated gloves, so we stayed warm…for a bit. Our legs were a little on the cool side, but our feet got really cold. At least our lunch break and fuel stop were in nearby Teslin! Only the grated bridge mentioned above stood between us and warm feet. Well that bridge was one minute of pure terror…ok, that may be a slight exaggeration. But it was the nastiest grated bridge I’ve been across. The spacing in the grate was larger than normal – we talked to a local later on and he said the grating actually moves around a bit based on the traffic (particularly trucks) moving over it. All I can say is the little wobble you feel going across this bridge was greatly amplified compared to other grated bridges. My dad got a good video, but we likely won’t post it till we get home. 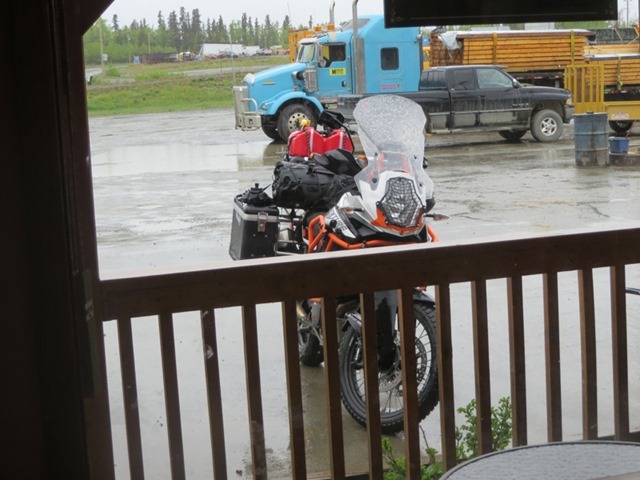 Once across the bridge, we pulled into the Yukon Motel for gas and lunch. The gas line was huge, so went for lunch first, and it was almost standing room only. While hanging out, we spoke with several other riders, and everyone talked about the crazy bridge. The rain did not let up at lunch, so we put our gear back on and hit the road again. 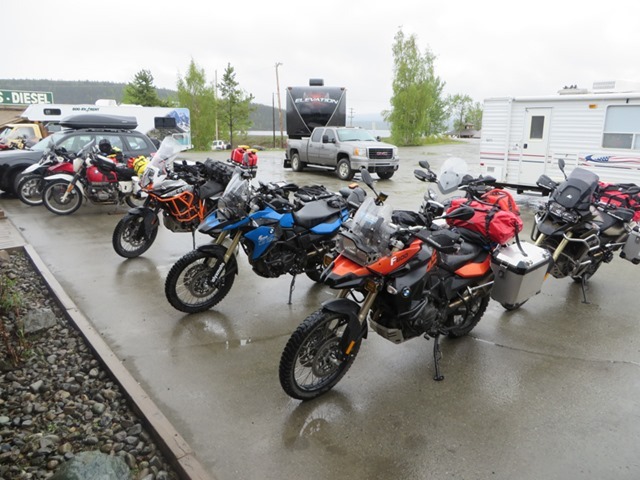 Motorcycles at the Yukon Motel…lots of BMWs and there is a Ducati hiding in the back. The rain stopped just about the time we pulled into Whitehorse, YT, our ultimate destination for the day. We decided along the way that this would be a good night for our first hotel room, so after doing a couple of laps around town we settled on the Westmark. The rooms are decent and they have a good internet connection. The shower wouldn’t drain in our first room, so the moved us a couple of doors down and bought us a round of drinks for the inconvenience…my first beer on the trip! Check out time isn’t till noon tomorrow and we are going to use all of it :). So, a really short day of riding tomorrow.